While Apple prepares for its Sept. 9 media event, enthusiastic fans are already lining up at the company's flagship Fifth Avenue store in New York, hoping to be one of the first in the world to nab an expected next-generation iPhone. In what has become tradition for major Apple product launches, customers armed with foldable chairs and supplies are camping out near the Fifth Avenue Apple Store's iconic glass cube, waiting for the company to launch its next big thing. Judging by photos sent in by reader Ryan, there appears to be around four or five line-waiters, two of whom can be seen staking their claim at the head of the pack. As in years past, the crowd is expected to grow in the days leading up to Apple's announcement. Since the event draws media attention, some companies pay employees —or hire temporary workers —to squat in line with branded T-shirts and prepped scripts. 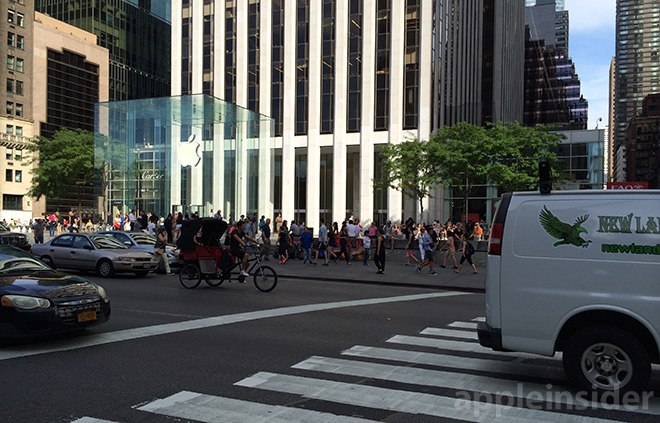 This year's Fifth Avenue Apple Store line formed six days prior to the scheduled announcement, whereas customers lined up three days in advance last year for what turned out to be the iPhone 5s. Apple usually schedules product releases for second Friday following an announcement, meaning people in line could be there for well over two weeks. At the Sept. 9 gathering, Apple is widely expected to announce next-generation iPhones with 4.7-inch and 5.5-inch screens, faster "A8" processors, boosted on-board RAM and possibly near-field communications (NFC) for a mobile payments platform. Also rumored to debut is a wearable "iWatch" device, though the latest rumblings say the final product may not launch until early 2015. 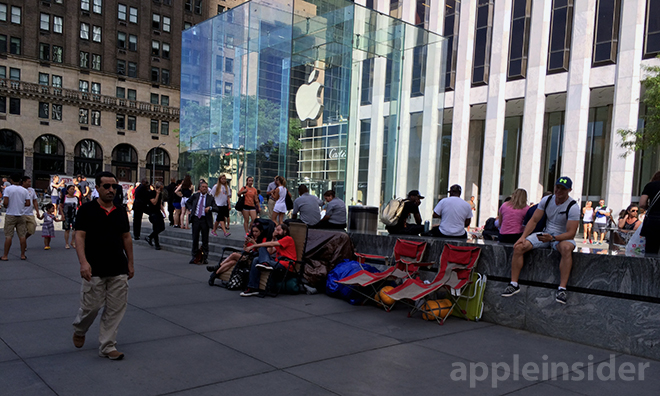 Update: The four people currently lined up in front of the Fifth Avenue Apple Store are not waiting with the sole intent of buying an unannounced Apple device, but instead to promote websites, AppleInsider has learned.